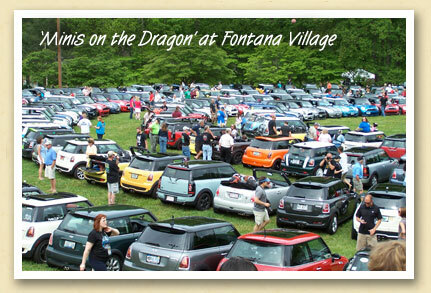 The tenth annual gathering of the ‘Minis on the Dragon’ group drew more than 800 Mini Cooper enthusiasts from all across the country. The early May event, centered at the Fontana Village Resort, benefitted a number of charitable organizations in Graham County. $6300 and 3000 pounds of food and beverages was donated to local food banks, and an additional $3500 was donated to the Graham County Chapter of the NC Breast & Cervical Cancer Control Program. On their website, the group describes the spectacular 11-mile Dragon section of U.S. 129 as “one of the best, if not the best sport car and motorcycle touring road in the country”. In addition to the legendary road, drivers said they were equally impressed by the beauty of the area. Most took advantage of the near perfect spring weather to explore everything around the Nantahala National Forest and Great Smoky Mountains National Park during their stay.